Did you know Plantation Toastmasters own’s it very own, 8-year-old, but still functional projector? 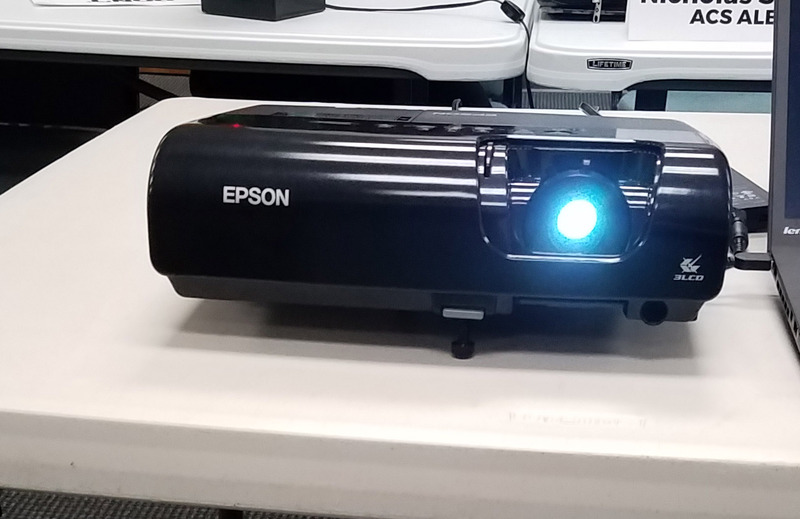 You can learn more about this Epson brand PowerLite 77c Multimedia Projector at this PTM University Link. Technology presents all sorts of opportunities for delivering a clearer message, but also involves a number of pitfalls. Today we discuss the logistics of how to pull off a better presentation involving the projector our club has. It’s inevitable: Something will go wrong if you are in front of dozens/hundreds of people and are on a tight timeline, especially if you haven’t practiced. Make some time before your speaking engagement to familiarize yourself with the equipment. Make sure if you do have a helper that they really know what is going on. If it’s an important enough event, make them prove it ahead of time! Here at Plantation Toastmasters, Nick typically help with this, but Nick is not not always available and/or are may be doing something else. As much as possible, practice connecting everything exactly as is needed in real life. This means using the same laptop you’ll use the day of, the same power cords, connectors, screen. The more realistic the scenario, the more likely you’ll discover missing equipment and or configurations while you have time to address them. It’s isn’t always practical to have the projector during this “home” phase of practice, but maybe connect a second monitor to gauge how your laptop behaves with a display device connected? Here at Plantation Toastmasters, your best bet is to arrive early. Perhaps arrange to have the projector earlier (Nick is usually there by 6pm, so he could take possession from Jim the week before). If your presentation will have audio and/or video, embed that content into the Powerpoint file itself. Internet isn’t always reliable in our part of the building there. This is good advice in general as you never know what type of Internet access you will have. The projector is shining in your face. To be as smooth as possible and not prematurely show your slideshow, why not make slide #1 a black screen? This allows you advance to your first real slide when you are ready, not necessarily while the projector is warming up. When finished, leave a black slide as the last slide. This allows you to wrap up, and finish the presentation. The projector shining in your face. A challenge we have at the Jim Ward Center is with the lighting. The room is either black-out dark or a bit too bright for using a projector. There doesn’t seem to be a nice medium. However, that is reality. You may find yourself dealing with this very situation in real life! Use high-contrast colors if you plan to present with the lights on. This means large black lettering on white backgrounds. If you presentation has high quality photos, you may want to consider presenting with the lights off. Photos look best with the lights off. Be warned that your audience may have trouble seeing you. perhaps you can speak and arrange with the sergeant at arms or another friendly helper in the room to turn off the lights during the segment of your speech that has the photos, and then they can turn the lights back on afterwards. You have arranged for time to practice this in our room ahead of time, right? Something else you can do to offset the darkness of the room is by using bright slides. Bright backgrounds light up the room some, allowing your audience to see you. Afshin Hatami gives a presentation with the projector at our club. Contact Jim Barber, who is custodian of the projector, to arrange for it to be brought to our meeting. His email address/phone number is available in the membership area of this website. Please give him more than 60 minutes of notice (preferable 7+ days and a reminder the morning of). Arrange for a video source with a VGA port. Familiarize yourself with the lights and projector screen control. The sergeant at arms is your best source for this information. If your presentation has audio, does it require more volume than the laptop’s built in speakers? We have an amplified pa speaker we can connect. Usually background music is okay on laptop speakers, but if there is spoken or your looking to make an impact with music volume, the amplified speaker is where it is at. Contact Nick Smith for the amplified speaker. Nick also has a good Powerpoint remote control you can use if you arrange ahead of time with him. Nick’s laptop has the connection needed for the projector, so if you prearrange with Nick (and he is present that week), he can provide his laptop too. Have you seen PTM University? Let’s admit it, presenting or presiding in front of a group of people is hard enough, but a lack of familiarity with what are you are doing is an anxiety multiplier! If only there was some way to learn more about the things we do here at Plantation Toastmasters ahead of time… Oh! …There is! Take a look at PTM University, right here on PlantationToastmasters.com! Acting as the Toastmaster of the Day for the first time? There’s a printable guide for that. Acting as Table Topics Master? There’s a guide for this too. Have you been asked to mentor? Here’s how to rock that opportunity! And, over the years, we have worked on developing a relatively comprehensive Member Guide. There are incomplete parts of it, for sure, but on the whole, it’s a great way for you to really familiarize yourself with the Toastmasters experience. Interested in contributing content to this project? Noticed an error/omission in the content? Please let Nick know (or if you don’t have his email, you can use the Contact Form). It all started with a dare. Plantation Toastmasters follows the principle that people learn best when they’re enjoying themselves. Consequently, the club’s meetings are lively and club leaders are always looking for fresh ways to generate individual enthusiasm and bring the members together as a team. Club activities are not constrained to weekly meetings. Outside events — including holiday parties, summer picnics, Toast-mixers, and other social gatherings — keep members enthused and involved. Which brings us to the dare…. Wolf rose to the challenge. Over the next few weeks, he wrote the lyrics and melody to the new club theme song. Now it was up to Juan to fulfill his part of the bargain. Juan said he could sing it, but it was a shame there was no one to hear it. “What if we record it?” Renting time at professional recording studio was out of the question, so they set up a studio in Wolf’s den. As he promised, Juan sang the lyrics that Wolf had written, with Wolf accompanying Juan on the guitar. To their surprise, it wasn’t bad! The song showed promise, but it needed something more. 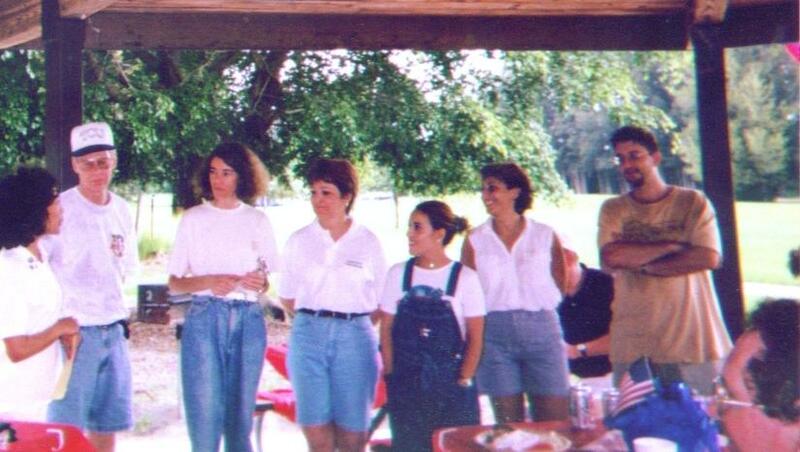 Fortunately, then-president Trevor Marks spent his weekends as the drummer for The Gist, a popular South Florida band. So Trevor was called in to provide percussion accompaniment. Even better! Encouraged with the unexpected quality of what started out as a simple tune, they asked if any other club members wanted to add their musical expertise — or just enthusiasm — to the project. Past club president Steve Bradbery was the first to step forward. Occasionally playing professionally as “SteveB”, he’s known around South Florida for his soulful sax solos. He added some jazzy sax to the arrangement, raising the song to a new level. Even club members who lacked a musical background wanted to be involved. Past club president and past area governor DTM Shantelle Moxie provided backup vocals. Finally, another past president, Jim Barber, offered to add the unique sound of the Australian didgeridoo to the mix. The result was impressive — and far better than anyone had anticipated from that initial dare. But there was still something missing. They decided “This is a song about the club, so the entire club should be involved!” It was impossible to get the entire 45-member club into Wolf’s den, so Wolf lugged his equipment to the next club meeting and recorded the entire club singing the chorus to “The Plantation Toastmasters Theme Song”. Since they were singing a cappella, without music, and without rehearsal, this brought a entirely new dimension to the members’ set of communications skills. After several hours of editing and mixing, it was finished — a theme song that truly represented the spirit and commitment of the club. 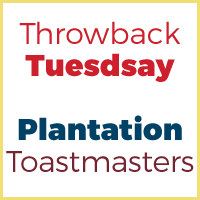 Although you’re not likely to hear the Plantation Toastmasters Theme Song on a Top 40 radio station, it has received a lot of “play” at local Toastmasters functions — and brought recognition to the popular South Florida club. But the greatest benefit was the sense of pride among club members when they heard their latest achievement. Once again, the Plantation club has demonstrated that the Toastmasters program is much more than simply giving speeches. They’ve shown that “wonderful people” working together as a team, do produce “spectacular results” — even if it’s the result of a dare. Tripping over my tongue to pull the foot from my mouth. One day I woke up — I had to do something about it! At the Jim Ward Center. I was so hesitant. We can help you to speak. We meet once a week. Make sure I’m speaking in time. To a capacity crowd (or any stranger I meet). You think you’re alone. You think that nobody knows. You can handle your fear. You’ll see it’s no big deal. Right into the eye of your enemy! Bring you closer to who you aspire to be! I’m DTM-in-the-making, and a fiend for applause. Plantation Toastmasters meets Tuesday nights, 6:30 – 8:30pm at the Jim Ward Community Center in Plantation Florida. Guests and Toastmasters from other clubs are always welcome at no charge! Visit https://plantationtoastmasters.com/ to find out more! The year was 1972, and things were a little different then. I-95 was almost brand-new, having been completed just a couple of years previously. The areas west of the new Interstate were just starting to grow, but there was almost no development west of University Drive. Broward Mall was a cow pasture, and Sawgrass Mills was swampland. What is now I-595 was then State Road 84, a 4-lane highway frequently interrupted with traffic lights. The westernmost motel was a Holiday Inn near the intersection of I-95 and SR 84, and most businesses outside of Fort Lauderdale stretched along US 441. At that time, there was a businessman named Michael Shayne (not to be confused with a current member of our club whose name is spelled differently but pronounced the same). Michael Shayne ran a real estate agency in Plantation, and when he wasn’t doing that, he was involved with Toastmasters. And by involved, I mean really involved. In 1972, Michael Shayne was only the 14th person in the world to earn his Distinguished Toastmaster designation. (By comparison, over 20,000 members have earned their DTM status today.) And in 1972, Michael was finishing his term as District Governor of District 47 (which at that time included the entire state of Florida as well as the Bahamas). 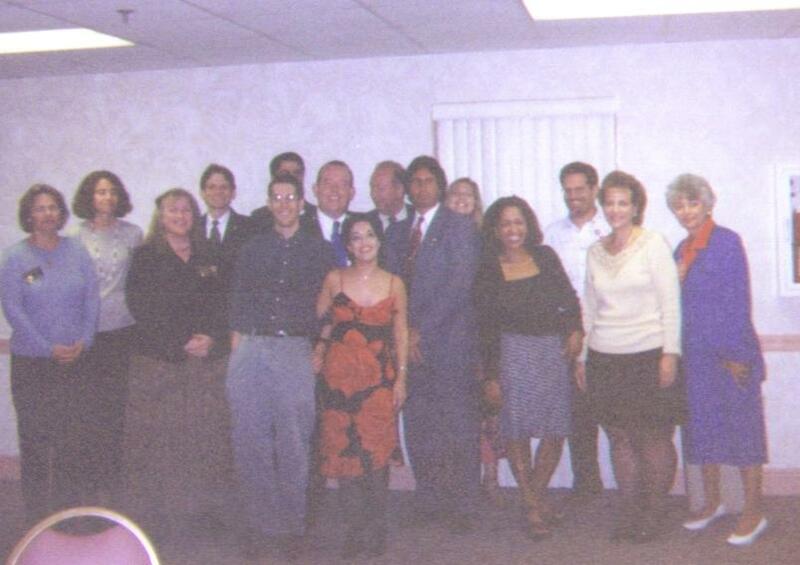 Although there were several Toastmasters clubs in South Florida at that time, Michael was disappointed that there were no Toastmasters clubs in Broward County west of I-95. He decided that a Toastmasters club was needed to serve people in the westernmost, largely-rural parts of Broward County, and since Michael was proud to be a resident of the 19-year-old City of Plantation (he was elected to the Plantation City Council the following year), he formed the club in Plantation and naturally called it “Plantation Toastmasters”. He served as the club’s first president. 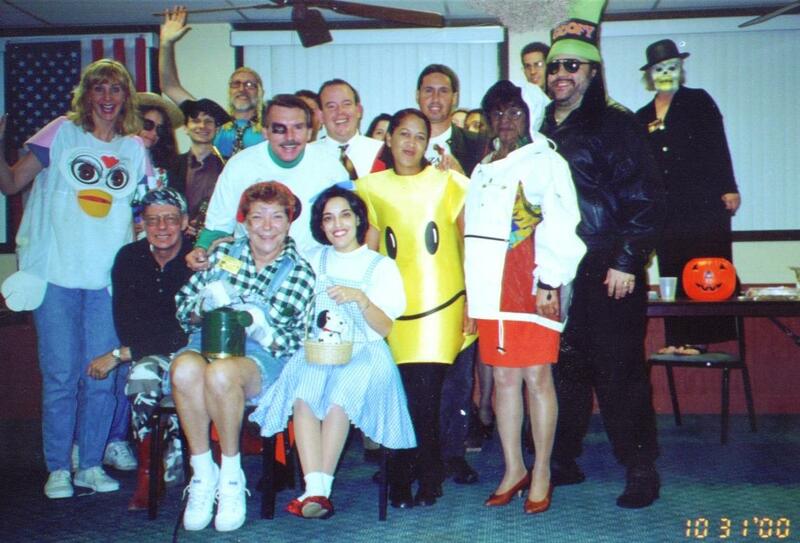 Plantation Toastmasters was officially chartered as club #2582 on April 3rd, 1972 with the requisite 20 members. (It was initially an all-male club since Toastmasters International did not allow female members to join until the following year.) The first meetings were held Tuesday nights at a Sizzler restaurant on 441 about a mile south of Broward Blvd., and they continued to meet there for over a decade. Since its founding, Plantation Toastmasters has produced one International Director (DTM Steve Bard), three District Governors / Directors (DTM Michael Shayne, DTM Steve Bard, and DTM Lynda Hammond), and scores of Division and Area Governors / Directors. Plantation Toastmasters has produced eight Distinguished Toastmasters: Michael Shayne, Steve Bard, Robbie Young, Peggy Miller, Val Jennings, Lynda Hammond, Shantelle Moxie, and Michael Schoen. Plantation Toastmasters has also produced numerous contest winners over the years, with Eric Jacobson easily earning the most trophies, and Shantelle Moxie and Jim Barber both advancing to the Regional Competition (as the Semifinals were called then) in the International Speech Contest. Over the years, Plantation Toastmasters has conducted a number of Speechcrafts and Youth Leadership programs. It has been a President Distinguished Club almost every year since the Distinguished Club Program was established. (Under the program which preceded the Distinguished Club Program, Plantation Toastmasters was once ranked the #1 club in the world!) It has received numerous ribbons and awards from both District 47 and Toastmasters International. It’s been an exciting 45 years. The next 45 years promise to be even better! Plantation Toastmasters meets Tuesday nights, 6:30 – 8:30pm at the Jim Ward Community Center in Plantation Florida. Guests are always welcome at no charge! For more information, visit https://plantationtoastmasters.com/ to find out more!